In a place where nature still creates and continents collide, Iceland has countless different types of terrain to explore and a multitude of different ways to explore them! Compiled below are various tour operators which are sure to intrigue and make your stay in Reykjavík memorable. We offer ATV tours and Jeep tours, between lava and black sand and up onto the mountain Hagafell. Ambassador offers exciting whale watching tours, marine wildlife and nature adventures at sea, including our famous Northern Lights Cruises - departing from Reykjavik old harbour. A fun and safe sport for the whole family! Daytours to and from Reykjavik for those who want to travel while running! Learn to make high quality Icelandic chocolates at home in only 60 minutes by easy, professional methods. A fun class for the whole family! Creative Iceland provides creative activities, cultural experiences, and custom-made itineraries for individuals, families, and groups. The original whale watching family in Reykjavik. Whale watching from Reykjavik is operated all year round with the high season being from April – October. We specialize in planning, organizing and operating experiences for individuals, groups, travel agencies or private companies. f-stop Tours is a year-round company, owned and operated by Michael J. Kissane, a dual US-Icelandic citizen who lives and works in Iceland for the past 26 years. Guided day tours with an angling professional are tailored to suit individual or group requirements, from people who have never fished before to expert fly fishers in search of specimen catches. We invite you to embark on a journey to see the wonders of Iceland. With its rough landscapes and vast wilderness, crystal clear air and incredible photographic wonders, Iceland provides visitors a chance to see something different around every corner. Green Energy Travel - Iceland is a new environmentally friendly touring company. We want to introduce you to the beauty and wonders of Iceland in a personal and exciting way. Experience the magnificent Harpa from behind the scenes. A stimulating journey exploring the less visible brilliance of this rewarded architectural masterpiece. We have 25 years of knowledge and expertise and offer a wide range of truly unforgettable tours and a network of over 170 carefully selected accommodations all around Iceland. We offer adventurous tours around the Icelandic landscape. In our customized luxury 4x4 trucks, we take you to impossible places of unspoiled nature, which few are privileged to visit. The Iceland Expo Pavilion - 360° cinematic experience. The diversity of Iceland in 15 minutes. A leading company which specializes in Landscape Photography Tours and workshops in the Arctic, offering a variety of tours both in Iceland and Internationally. Icelandic Riding is a small horse rental in Reykjavík. Our aim is to deliver authentic experiences to all those who like to try the Icelandic horse. Ísafold Travel is a licensed tour operator and destination management company in Iceland, founded in 1997. We provide unforgettable Highland tours in Iceland, for groups and individual travelers. We have horses of different temperaments, enabling both novices and experienced riders to have an enjoyable and safe ride. We offer private tours for small groups. Our goal is to introduce Icelandic culture to our guests by meeting up with local people. Videy offers you a change in pace for your northern lights expedition. Your visit to Reykjavik is incomplete without traveling along the city’s coastline by bike. You don't just see the essential “must-see” sights of Iceland’s capital; you'll hear the stories that bring these places to life! The Reykjavík City Library hosts literary walking tours in downtown Reykjavík every Thursday in June, July and August at 3 pm. Reykjavík City Library has offered literary walking tours, mainly in downtown Reykjavík, since 2003. Reykjavík Viking Adventure offers sailing tours on an authentic Icelandic Viking ship from the old harbor. Salt Eldhus Cooking School invites you to join them for some delicious fun and a chance to cook with fresh local ingredients under the supervision of skilled instructors. We have the traditional and commonly known Airport shuttleservice between Reykjavik and Keflavik International Airport. We provide planning, booking, operating and we guide several tours around Iceland; all according to your needs. Sólveig's Reykjavík Kultur Kitchen provides cultural experiences for foreign guests through local cuisine, musical events, and stories from Icelandic history and culture. We offer a wide variety of day tours, tailor made and private tours; as well as guided and thrilling excursions through the nature in Iceland. Informative - Easy and Fun! Some have even described it as a modern national museum. Tales from Iceland is an exhibition on Iceland and Icelanders. It is set up on two floors, a nature exhibition, and a news exhibition. The Bowling Palace offers 18 high quality bowling lanes, with automatic scoring system and new plastic lanes. In the tastiest sight seeing tour in Iceland, we explore the down town Reykjavik area through 13 delicious local cuisines that you would never come across in your typical “to-do in Iceland” itinerary! For approx. 4 hours you will stroll around the city and visit 6 unique restaurants with a fun & knowledgeable local guide by your side. Travelade is a website to help travelers discover the best articles and travel blogs about what to do in Iceland, curated by local experts. Viking Horses is a small family run business located on the outskirts of Reykjavik. We specialise in exclusive private tours and small group horse riding adventures with a professional and personal service. Your Friend in Reykjavik is a small family run travel company. We offer walking tours in downtown Reykjavik for smaller groups, never exceeding 12 people because we like to keep it personal and get to know each and every one of you. We love showing you around all our favorite and not so known stops in our monster Super Trucks. Angling Club Lax-á is Iceland’s largest fishing and hunting outfitter, with over 40 exclusively leased salmon rivers and beats. We are an adventure company based in South Iceland and Reykjavík offering one of the largest selection of adventure trips in Iceland. From our great rafting trips to lava caving, trekking and glacier hikes to self drive super jeep tours, winter expeditions and everything in between. Arctic Trucks Experience offers private tours in Iceland on modified Arctic Trucks where you can do the driving. Want to feel young and fresh again? Then come Buggy with us! It will add years to your life from all the laughter and fun you will have. Two hour long, free / tip-based walking tour around Reykjavík, with 25 year old Marteinn Briem. Birna's knowledge of the cultural dimensions of both country and people, along with her connections to the very hub of downtown Reykjavík make her the perfect companion. On the tour we will take you out into the dark blue yonder of Faxaflói bay in search for the mystical phenomenon we call the Aurora Borealis or Northern Lights. Elding Whale Watching specializes in activities on sea such as whale watching, puffin watching, sea angling, northern lights cruises and the ferry to Viðey Island. Experience Iceland is a fully licensed private superjeep tour operator service. We aim to service smaller groups on tours out of Reykjavík in a luxurious super jeep and into activity if preferred. We offer a wide range of high quality services for travelers from all over the world. Scheduled day tours from Reykjavík and longer tours. Fjallabak is a family run travel agency who will make you realise an unforgettable experience in the Icelandic nature. We aim to service people who want tailor made tours or activities, so they can enjoy the perfect experience in Iceland. Gavia Travel is a Nature and Wildlife Watching holiday organizer in Iceland. Our team includes some of Iceland’s leading ornithologists, geologists, nature and wildlife photographers and Iceland’s most active and best known birders. For more than 70 years, our company has hosted travelers from all corners of the world. Harpa Yachts offer both tailor made and scheduled yacht cruises, from the old harbor in Reykjavík. Hafnarfjördur is famous for having one of Iceland’s largest settlements of elves, dwarfs and other mystical beings, which (translating from the Icelandic) are collectively called ‘Hidden Folk’. We offer a variety of tours, two hour, half day and a full day, or few days tours. We have variety of predefined tours but we can tailor make tours for you, anything is possible. Iceland in a Day focuses on privately tailored super jeep day tours and multi-day tours, where no two tours are the same. We offer adventures into the fascinating nature of Iceland - we have served thousands of happy customers and helped them explore the natural and unspoiled beauty of Iceland. This three-hour workshop is designed for knitters of all levels and ages – beginner to advanced. The workshops are lead by the qualified crafts teacher ragnheiður jóhannsdóttir, a highly skilled knitter with over 40 years of experience. We specialize in customize your tour in Iceland to suit your specific tour duration, tour budget and any special custom requirements that you may have to ensure your dream vacation. We offer multi-day tours that require good riding skills and knowledge of horses, while our day tours with departure from our Riding Centre, are well suited for people with little or none riding experience. The Church of Kópavogar stands on Borgarholt Hill, offering great views over the city and surrounding area. We are a family-run tour operator that organizes tailor made luxury travel for discriminating visitors; individuals and groups. We offer a range of fabulous scheduled and bespoke tours and activities, including snowmobiling, helicopter flights, ATV tours and fishing to explore and enjoy the wild and rugged beauty of Iceland’s spectacular nature. We have decades of experience of travelling safely in the Icelandic wilderness. Our team consists of mountain search and rescue volunteers, experienced hiking guides, super-jeep experts and responsible adventurers. Our helicopter charters are ideal for experiencing some of Iceland's most stunning locations. Pink Iceland is Iceland's first and foremost gay and lesbian owned and operated travel and wedding expert. Reykjavík Escape is a live escape game where groups of 3-5 people are locked in a room filled with riddles, puzzles and clues. Reykjavík by the sea with our Whale Watching tours, Northern Lights by boat and Sea Angling including the taste of the catch of the day. An entertaining, educating and easy walking tour in downtown Reykjavík, through it’s past and present. This tour is a must do for first timers and experienced fishermen alike. Just breathing in the fresh air, being out in the open ocean and catching your first fish of the day make this an experience you'll never forget. Smáratívolí guarantees a great time for all ages in a setting that has not been seen in Iceland before. Explore the Icelandic nature on the sturdy and sure footed Icelandic horse. Sólhestar offers a variety of riding tours for absolute beginners and more experienced riders. With Special Tours you can enjoy a variety of different adventure tours! We offer a selection of private (exclusive) and group activity holidays, short breaks,luxury weekends and day trips with a seasonal theme. We are a bus and coach service company with great experience in planning short and long tours around Iceland, for Icelanders as well as foreign tourists. We offer riding tours in Reykjavík, but still in a country side landscape with a view over Reykjavík and the mountains surrounding the city. We specialize in private tours both highlights of Reykjavík and day tours out from Reykjavík. Cruise ship passengers are very welcome to order tours, also stopover passengers in Keflavík airport. We are a fully licensed tour operator and travel agency with a focus on an eco-friendly adventure tourism in Iceland. We organise walks and hikes off the beaten path in the unique landscape of Iceland. Framed by glaciers, volcanoes and spectacularly varied landscapes, which are virtually in the making. We can arrange a car for your self drive tours or guide you into Iceland’s untouchable nature and exciting places with our Super Jeep Tours. Guided nature walks in Mosfellsbær countryside, only a 15 minute drive from Reykjavík. Arctic Exposure is a leading Photography Travel Agency in Iceland. We focus on providing quality Photo Tours for Photographers of all skill levels. Specializing in mountain biking adventures, Bike Company is a licensed travel agency in Iceland. Guided tours are definitely one of the easiest and most enjoyable ways to spend your Iceland vacation, especially with Bustravel Golden Circle Tour. Courthship in The City is is ideal for those who want to learn about the dating- and clubbing- jungle from a local. Eldhestar takes pleasure in showing visitors to Iceland the unique wilderness with a horse. The puffin watching tour commences at our ticket office by Ægisgarður pier in the Old Harbour in downtown Reykjavík. Extreme Iceland is an all around fully licensed travel agency where the customer and the Icelandic nature are put into the foreground. We have something for everyone, both individuals as well as groups. Action-packed fields where strategic games can be played that test the player's resourcefullness, creativity and amusement to the fullest. We offer day trips to high quality waters in the Reykjavik area. Our trips are ideal for those that are looking for a short break from Reykjavik. Fun Travel is an independent tour operator and a destination management company. Go Fishing specializes in first class tours for both individuals and small groups of anglers who prefer a personal service. Gray Line Iceland, a leading tour specialist, is a fully licensed coach company, tour operator and travel agency that has been operating with great reputation for more than 25 years. Helo offers various helicopter services and adventures all over Iceland´s exceptional nature, specializing in sightseeing- and private flights. HL Adventure is a Destination Management Company (DMC) and an authorized tour operator based in Iceland. We are a small company which takes pride in offering either private, tailor-made or specialist tours. We have 20 years of experience in this kind of tourism. We are a family-run company which offers personal and premium travel services with focus on private day tours, multi-day tours, activities and accommodation. Iceland South Coast Travel is a family company organizing private jeep tours and hiking tours with professional and experienced guides. We offers a great selection of Iceland Tours including hiking tours, trekking tours, Iceland horse riding, mountain climbing and mountaineering, Iceland glacier tours, ice climbing and more - a great idea for your Iceland adventure vacation! Our tour company offers a great selection of guided adventure tours, such as glacier tours, self drive, incentive, super trucks, river rafting, snowmobile, horse riding, hiking, ATV and whale watching. We offer day tours and longer tours to groups as well as arranging accommodation and pick up from the airport if required. As a family run, fully licensed tour operator, our main purpose is to introduce travelers to the amazing, gentle and one-of-a-kind Icelandic horse. Short courses, with a proficient language teacher (3 hours at the most) on how to meet the natives, order coffe, say hi, etc. Mountaineers of Iceland is a DMC, Destination Management Company, operating adventure tours since 1996, specializing in Super Jeeps and snowmobile tours, mainly in the south western part of Iceland. Reykjavik Nightlife Friend is an exclusive VIP nightlife service. We take you to the best places to party in Reykjavik, get you VIP entrance into the best clubs, arrange bottle tables and help you break the ice with the locals. The Northern Lights, also known as the Aurora Borealis, can be experienced in Iceland during the winter time on clear crisp nights, where they appear in a variety of colours and intensity. Réttir - Annual Sheep Roundup! During the month of September both Icelanders and a fair number of tourists head-off to the countryside to take part in Réttir - the annual sheep roundup. This 1 ½ hours guided tour on a traditional Icelandic fishing boat offers a unique view of Reykjavík from the sea, where you encounter its bird-life, art and Icelandic maritime culture. Reykjavík Excursions was founded in 1968 and has since then been the leading organizer in tourism in Iceland, both for individuals and groups. Reykjavik Sightseeing is a leading operator of guided day tours in Reykjavik city and the southwest of Iceland. The company is owned and run by pioneers in the Icelandic travel industry. We are a privately owned adventure company with many years of experience and a fine reputation in operating and planning adventure and convoy tours in Iceland. Among the tours we offer is the Food and Saga Dinner Tour, where Chef Tyffi caters to your needs. He will take you to the gourmet shops in Reykjavík and then to his home for a great gourmet dinner. Snaeland Grimsson Travel was founded more than 50 years ago by one of the leading pioneers in bus rental and organized tours around Iceland. We are a small company offering private, tailor made tours or predefined day tours. We offer both day tours and multiple day tours to Iceland´s most facinating and unique underwater sights. A Segway tour is one of the most exciting ways to see the Reykjavík scenery. The Angling Club of Reykjavík has a variety of trout and salmon fishing permits available in all price catagories, for many of the most prominent fishing spots in Iceland. 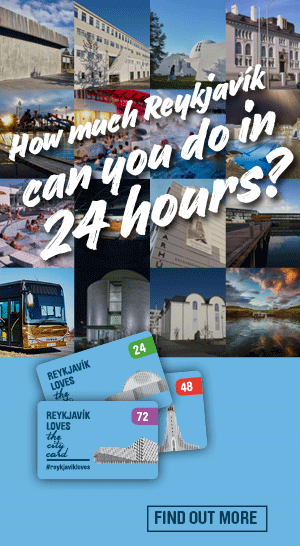 In the 3 hour Reykjavík Bar Crawl you will experience all the best of Reykjavík by night. We at Tuk Tuk Tours are on a mission to create an alternative way to enjoy Reykjavik in a more fun, intimate and eco-friendly fashion. Whales of Iceland is the largest whales exhibition of its kind in the world. Close to downtown, this is truly an immersive exhibit that will take you into the world of the whales.